A cyber-based micro-nation founded on 01st March 1998 is based in Wells, Maine. It is an organization dedicated to the study and restoration of ancient Roman culture. Location is known as worldwide with no territory claimed. Rulers are two Censors, and other Roman Magistrates elected from citizens on a yearly basis. Obverse Imprint: Seated figure of Iuppiter Optimus Maximus, (Jupiter, Best and Greatest) holding Winged Victory. The letters "IOM", the abbreviation of Jupiter's name and title, appear below. 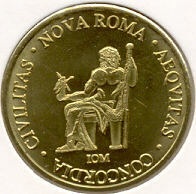 Legend around the rim of coin reads: NOVA ROMA - AEQUITAS (equality) - CONCORDIA (harmony) - CIVILITAS (civility). 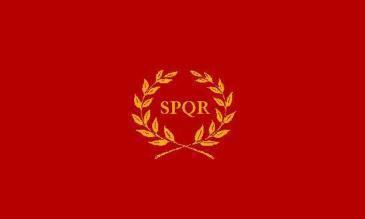 Reverse Imprint: SPQR (Senatus Populusque Romanus) in wreath, the symbol of Nova Roma. Below is imprinted the coin denomination, I SESTERTIUS. 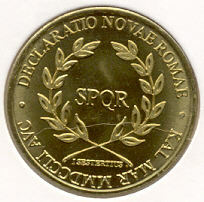 Legend around the rim of coin reads: DECLARATIO NOVA ROMA (Declaration of Nova Roma) - KAL MAR MMDCCLI AVC (Kalends of March, 2751 AUC, or 1st of March, 2751, Ab Urbi Conditum, or "The Year of the City".) 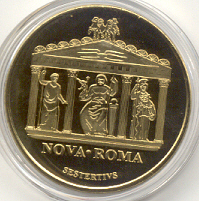 This commemorates the founding of Nova Roma, March 1, 1998. They use the Roman Calendar, which commenced when Rome was founded in 753 BC. Their “trade token” is customarily placed in actual circulation at all their events (such as the annual Roman Days). Details of this trade coin can be viewed at http://www.novaroma.org/macellum/coins.html. The value of this coin is equivalent to 50 cents of United States. I purchased year 2751/1998 1 Sestertius (Sestertius Signum) bronze metal coin from Chaim Dov Shibolet. He deals with unusual world coins and can be contacted at (shibolet@yahoo.com). The building is topped by a quadriga (as it actually was) that is coming toward the viewer. Only the fronts of the horses are shown. The roof is bordered by seashell antefixi. The pedimental sculpture is a “vajra” lightning bolt. This pedimental decoration was actually shown on Capitolium coins of the Republic. It is a very important symbol, appearing in a somewhat altered form on Roman shields. This vajra also figures importantly in Buddhist art, symbolizing power and authority. It is believed that the vajra was taken into Buddhist art at a very early period, under the influence of Hellenistic art, which also transmitted conventions of pose and draping. Thus the vajra, well attested to in Roman art, forms a bridge across continents, cultures and ages, always as a symbol of power. Only we Romans retain it in anything like its original context. The entire temple sits on a simple base supported by the large legend “NOVA•ROMA”. This symbolically shows that Nova Roma supports the Religio and provides a new home and welcome for the Roman deities. The figures, as mentioned above, are all based on extant sculptures and the poses are consistent with those on actual Roman coins. Iuno on the left is shown as a proper and dutiful wife, wearing a stola but crowned with a diadem. She makes an offering from a patera while holding her staff in her hand. Iuppiter is shown seated, holding his scepter which disappears out of view above. He catches his constant companion Victory in his hand, who offers him a wreath. Next to Iuppiter is a symbol of Terminus, who of all the Gods refused to make way for the Temple of Iuppiter, foreshadowing the stability of the city and the Romans. On the right is Minerva, a dutiful daughter. She holds her spear and shield, showing, along with her stern look, that she is ready to defend family and home. She wears the aegis, adding to her fearsome look, but it is possible to see that she is still a young woman. Together with Iuno and Iuppiter she forms a family group, showing the central importance of the family to the Romans. At the base of the coin, curved against the rim is the word “SESTERTIVS”. This word never appeared on Roman coins, but as modern Romans we need a bit of help, and it corrects the “SESTERTIUS” of the original coins. The surrounding legend (FR•APVLO•C•LAENATE•COS) is the consular date for the year MMDCCLVIII AUC. 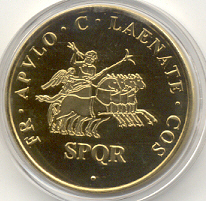 The central figure is a common one from coins of the Republic, Iuppiter in a quadriga driven by Victory. Iuppiter again holds his staff, and now wields a vajra thunderbolt in his upraised arm. Victory, wings spread behind her, holds the reins. The horses go forward with energy but with dignity. Iuppiter, Victory and the vajra tie the reverse image to the obverse, and the seated Iuppiter with Victory on the obverse ties this coin thematically to the previous Sestertius Signum, the "Declaratio". To build an active trade economy for Nova Roma. To act as a promotional/collectable item to encourage public interest in Nova Roma. To be a physical token of sovereignty, available to all Citizens. To help provide a Roman atmosphere at live Nova Roma events. To enhance Nova Roma's status as a viable organization/micronation. To provide a Roman item that can be used as an offering to the deities of the Religio Romana. Nova Roma sets the redemption value of its coins at 50 US cents (or the equivalent in other currencies) to 1 Sestertius. Nova Roma guarantees to redeem coins at this value so that they may be used as trade coinage at events, within NR Provinciae, trade with Ordo Equester vendors and more. Coins that have been deliberately defaced or altered are non-reedemable. NOVA ROMA is an organization dedicated to the study and restoration of ancient Roman culture. From its legendary founding in 753 BCE to 330 CE, when it ceased to be the center of Imperial authority, Rome set the standard and laid the foundation for modern Western Civilization. Rome civilized the world, and Nova Roma see's the need for that divine mission to be kept alive. Founded 2,750 years after the Eternal City itself, NOVA ROMA seeks to bring back those golden times. But where ancestors imposed their will through the sword and the legions, they intend the same result through the spread of knowledge and through there own virtuous example. In April, 2003 the Senate of Nova Roma approved the purchase of a 10-acre ranch in Texas, USA. (Nova Roma's America Austroccidentalis Provincia.) This land is a symbol of Nova Roma's dedication to our future goal of a larger world capital. It is also is a confirmation of Nova Roma's existence as a viable organization with practical real world objectives. The parcel of land Nova Roma purchased is located in Culberson County in West Texas. The land serves both as a symbolic world capital, and also as the ager publicus (public land). Any Citizen of Nova Roma is welcome to visit it should they travel to the area. Currently the land owned by Nova Roma is undeveloped. Denomination of the coin is Sestertius, official name: Sestertius Signum and common name: "Quadriga". Diameter: 32mm, thickness: 2.25mm, edge: plain, material: brass, year minted: C. Buteone Po. Minucia cos.‡ (MMDCCLIX a.u.c.). Quantity minted: 5000 circulation coins, 250 proofs. I obtained my proof coin through Oded Paz.